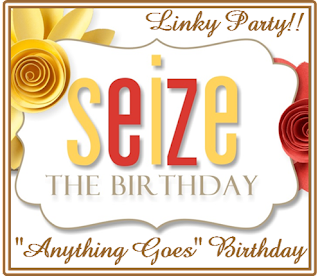 It is time for another Seize the Birthday Challenge. Sentiment is from Clearly Besotted, A Little Sentimental and Gold embossing powder on vellum. Thanks for stopping to see more. 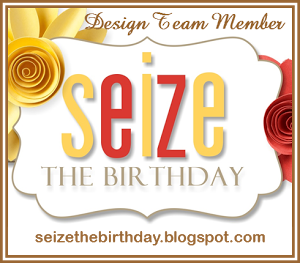 I will be looking for your entries at Seize the Birthday this month. I am taking a class at Altenew Academy. It started yesterday and the instructor is Marika Rahtu. Not only is she a great paper artist, but I love to listen to her voice. In this lesson, she taught us to use our markers and second generation stamping. Paying attention to the details. I have used the solid small stamp from Peony Bouquet and two markers. After stamping once, stamping again to make a fuller flower. Then using the fine tip of the marker, going over the petals to define them. I did some experimenting first, before going in for the finished project. Using the clear sentiment from Spring Daisy, I was able to curve it slightly before adding it to the card. This is my card for lesson #1. I will have to watch the other lessons after we return from our road trip. The lessons are mine forever, so that is possible. Since I will not be able to make a card while on vacation, I am bringing my colored pencils and coloring book. It will be very hard not to watch while we are gone. But, something to look forward to when we return. Thanks for stopping by, as always, love the comments. 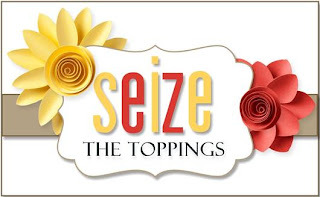 Seize the Birthday Anything goes, no toppings! There are no Toppings this month. Just stick with "Anything Goes"Birthday! I went to my cameo ( dusted it off ) and cut the word , happy three times. I used Ocean Mist card stock from Gina K Designs, and glued them together. On a panel of White card stock, I stamped the flowers from a Cas-ual Friday stamp called Mom Ami. Then used some water and ink and colored them in. On the main image, I heat embossed with white and also water colored that. Here is another view of the card where you can see the inside. I just stamped the tip of the flower along the edge for that. I will be using my Cameo more for this kind of thing. I love how this turned out. I am excited to see your beautiful birthday cards this month. Thanks for stopping in and I do appreciate your comments. Today I am playing along with the challenge at Papertrey Ink. I was impressed by Nicole Headly's Wood Block Prints. It reminded me of all of the beautiful mosaics that we saw in Morocco. I chose to CASE this card from Nichole with a stamp from Hero Arts, that I embossed with white, onto a panel of water colored paper. I used warm colors from my Kuretake paints with a touch of teal to color it. That panel is mounted on a base of PTI card stock, Orange Zest. The banner is the same card stock. I also stamped the Splits Stamp, Just a Note with white embossing powder and used that on the banner. Some stitched lines with a white gel pen to finish. Just Us Girls #347- Trend Week! Today's card, got a start late last night. After going to bed for the night, suddenly, an idea popped into my head, Funny how that happens, as I didn't think that I was thinking about a card, but it did. I kept thinking about a twist on the challenge that I had seen at JUGS and it would not go away. You have all had this happen to you....right? I am not the only one who gets up after midnight, and makes a card.....right? So go along with me here when I show you what I did. 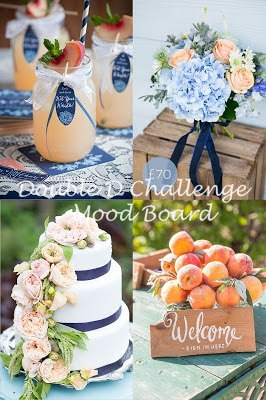 The trend for this challenge is called Spotlighting, and my good friend, Nancy is the host. What I thought I would do is to combine two different techniques on this one. The spotlighting and inlay die cuts. I stamped this bird image from Stampendous, called Cling Snow Bird and then used a die from PaperTrey Ink called Star Scribble. 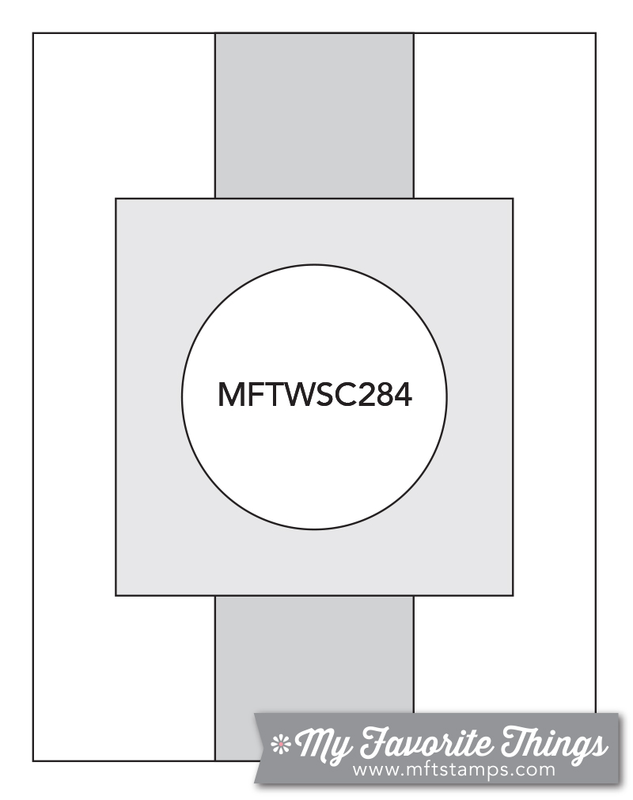 I thought it would be fun to use a die that was different than a circle or oval for the spotlight. I used a layer of copper foil paper under the white and it all when on a base of kraft paper. I cut several stars out of the same foil and used them around the die cut. The Hello is also cut from the same foil paper. It really sparkles. Here is a different angle to show you all of the shine. I think I was successful in getting my idea onto paper. I know this bird is more of a winter scene and we are having a great start of summer weather this year. I colored him with copic markers and he looks like the birds that feed right outside my craft room window. Thanks for stopping in today. I hope you enjoy what I have done, and in some way, I have inspired you to join in this challenge. Thanks for you comments, and I do love them. OK, I do have a sickness, but it is not bothering me and I just take two aspirin and go to bed. Just having fun with you. Receipe : MFT Primitive Chevron Background, stamped on to white card stock. Layered on to black and then a base of Jelly Bean Green. The panel in the middle is sponged white card stock with the Jelly Bean Green ink. One way to use up scraps. I wanted to make this a happy card, so I stamped musical notes on the background of the square. 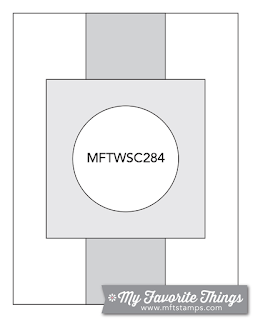 The Sentiment die is also MFT. Just a quick and easy card. I will make this a short, my card for this challenge can be a wedding or anniversary card. I used Gina K Designs Card stock in Powder Blue, Peach Bellini and White. Gina's stamp called Wild Blossom, and the sentiment from another stamp Duo, called Always and Forever. Spellbinder border die, white layer cut, blue layer embossed. The ink is also Gina K called Peach Bellini. It is so easy to ribbon as Gina also had matching powder blue ribbon. 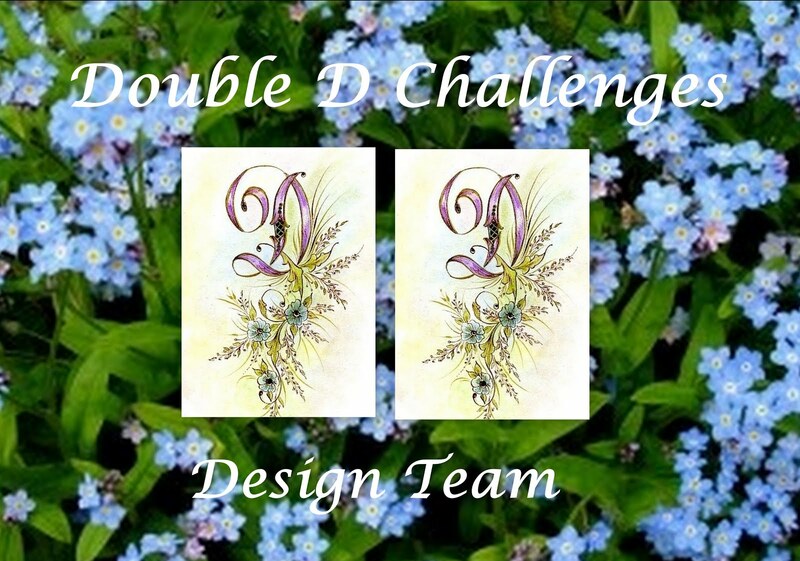 This is the card that I will enter in the Double D Challenge. I am showing you this card, as I made it for the same challenge. Poppy using no line coloring. I just wanted to use it again. So I fussy cut it and put it on another base. Some days, you just have to go with what ever works. Thanks so much for stopping by, Enjoy and I love your comments. Today's card is a bright and happy card made rather quickly with the use of dies, and a bit of stamping. Several punched flowers with a Stampin Up punch. I will be entering this card in the make it Monday #252, Shadowing with Copic markers. Thanks for stopping by, I hope that you enjoy and I appreciate your comments. See you soon. Boy, was I ever inspired buy this photo. Lovely colors and flowers and the delicate background. I kept my card light and feminine, with the colors and texture that I saw. Love the pale yellow to white flowers and the greens in the photo. Distressed inks in Antique Linen and Squeezed Lemonade and Bundled Sage- all painted on with water. Here is a picture at a different angle so that you can see the sparkle. Thanks for stopping to take a look. I love your comments. Vellum and Swiss dots EF, watercolor paints. Thanks for stopping by and the comments that you leave. Wow you just need to check out what Dawn, at Capture the Moment has done this week. It is so bright and fun and easy to do. I'm going to get right to it. Here is my card. I used a die from Die-namics to make this cut, called Four Way Chevron. I did not have one from PTI. After water coloring some paper with Zig Clean Color pens using all greens, I left it in the die and applied adhesive to the back and then pasted it to the card base of GKD Sage Green, and peeled off the negative. I then cut a border with a Spellbinder die and the beautiful butterfly was made with What the Doodle Butterfly from PTI. Here is another view showing the Wink of Stella that I applied to the entire butterfly. The sentiment is embossed with Platinum EP and is from the same PTI stamp set. Thanks for stopping by, I love the comments. Thank you for taking time to leave them. Donna Phelan and I are your hosts this week at the Mod Squad. We did a challenge awhile back that we had fun with and we are bringing it to you to see what you do with it. The challenge is to have something peeking at you through the front of the card. Take a look at my card and you will see what I mean. I used a die from Memory Box, Vivienne, to cut the butterfly in the card. The long tails are hand cut to let more show through. This is Gina K heavy base weight card stock and I embossed it with the Swiss Dot folder. On the side, I cut a new border die by Penny Black. It is cut from white paper, but you can see in the picture that it is not the same color white as Gina's. It does not show up that much IRL. A banner of vellum across the front with my favorite Happy Birthday stamp from Gina K Designs, Birthday Greetings. Love the font and it is heat embossed with gold. Now, to open the card and see the surprise. Inside is the stamp Stately Flowers 2 from Melanie Muenchinger, along with the sentiment form Birthday Greetings. Flowers are colors with copic markers. After coloring, I added some details with a white gel pen to make it really pop. I love this card and how it turned out. 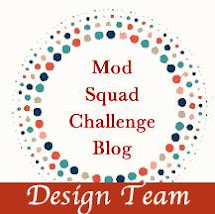 Thanks for stopping by, take a look at the challenge going on at Mod Squad Challenge this week. There are two prizes, and you will get another entry if you use one of the sponsors products. Sponsers are Gina K Designs and Altenew. New and exciting stuff is our game.